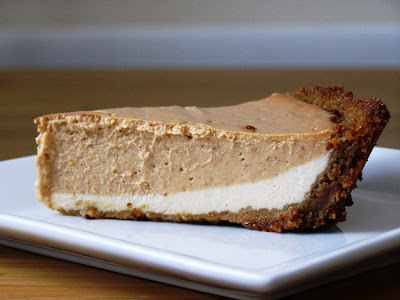 So I still had some pumpkin puree leftover from thanksgiving which considering I have to buy it specially wasn't going to let it go to waste, and saw this cheesecake on the fat free vegan blog. It's definitely not fat free but is of course very good. It only took a cup of pumpkin in the top layer so is not strong in the pumpkin taste. I didn't have any rum so added 1/2 tsp rum extract which gave this a definite egg noggy taste to it which is nice, although I may add 1/4 tsp next time. It called for a premade graham cracker crust, as you can't buy those here I made a ginger nut crust, the flavour of ginger going perfect with this. My crust got a little bit singed on top due to my inabilty to wrap some foil around the edges - seriously, can anyone do that?? Mix the crumbs and sugar together, stir in margarine until mixture is moist. Press into pie plate until even. Chill until ready to fill and bake. Recipe for cheesecake available from above link.